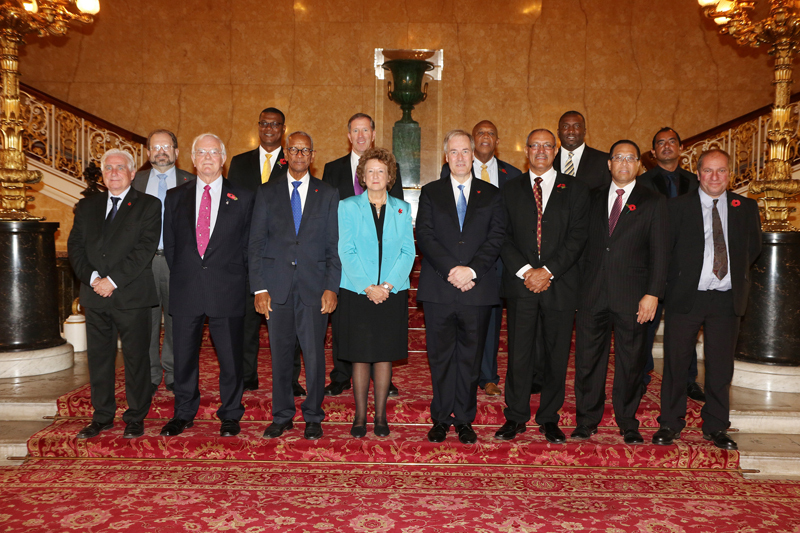 Premier Michael Dunkley concludes his participation in this year’s Overseas Territories Joint Ministerial Council [OT JMC] meetings in London today. “Today’s formal Joint Ministerial Council meetings, chaired by Baroness Anelay, Minister for the Overseas Territories, featured sessions focused on economic development, including infrastructure, good governance, anti-corruption, child safeguarding, European Union negotiations and international trade,” a spokesperson said. “A morning session on infrastructure was co-chaired by the Rt Hon Lord Bates, Minister of State for International Development, Department for International Development. “During the session, the UK Government formally acknowledged its support to the Bermuda Government in its redevelopment of the L.F. Wade International Airport by providing an Entrustment for the Canadian Government to proceed with the project. “As it relates to good governance and anti-corruption, recognition was given that Bermuda will table legislation in the upcoming Parliamentary Session enabling Bermuda to have the OECD Anti-Bribery Convention and UN Convention Against Corruption [UNCAC] extended to Bermuda. “The matter of child protection was also a paramount focus earlier today, with the signing of a Memorandum of Understanding [MOU]. “Formally titled the Memorandum of Understanding: Concerning the Closer Co-Operation Between the Governments of British Overseas Territories and the Government of the United Kingdom of Great Britain and Northern Ireland to Facilitate the Joint Sharing of Information for the Purposes of More Effective Safeguarding of Children – the initiative was led and presented to the JMC by the Falkland Islands Government. “The afternoon sessions focused on the European Union negotiations regarding ‘Brexit’ co-chaired by Mr Robin Walker MP, Parliamentary Under Secretary of State at the Department for Exiting the European Union . The OTs were advised that the UK will play a full and active role in the EU until its departure and will continue post exit. As a current member of the EU, the full range of obligations and benefits afforded to the UK will remain,” the spokesperson added. “The OTs were advised that they will be kept fully abreast of the various stages of ‘Brexit’ as the negotiations progress. It was agreed to establish a Joint Ministerial Council European Negotiations prior to the evoking of Article 50 by the end of March, which will be chaired by Mr Walker. The British Government is obviously not aware of the majority view of the Bermuda population that do not want the airport deal being presented by the OBA government. Bermudians have developed an alternative plan, that has funding support for the deployment, which offers more value for money. Steps need to be taken to enlighten the UK on exactly whats going on since the Bermuda politicians are being very dishonest inside and outside of Bermuda!